A long, narrow coastal strip of land running the entire western length of South America, from the southernmost tip of the continent to the border of Peru in the north, Chile is a land of astounding natural beauty, framed by the majestic Andes mountain range. Its landscapes are incredibly varied. In the north is a large desert rich in mineral resources. Its central area is in a river valley, where most of the country's population resides. 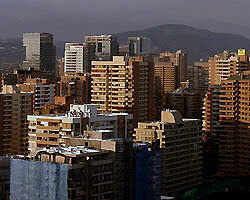 The historic capital, Santiago, is also located on this central plain. Vineyards lie in the north of the valley, producing the fruit for Chile's famous red wines. Thousand-year-old forests cradled among serene lakes and volcanoes dominate the country's south. The coastline in the south consists of fjords, inlets, and peninsulas and some islands. Thanks to its considerable length, Chile's climate varies greatly, from hot and arid in the north to chilly in the far south close to the Antarctic. Most parts of the country, however, are blessed with a cool and pleasant climate. The country's name originates from the indigenous word chilli, which means "where the world ends". This long country stretches so far south that part of the Antarctic is included in its territory. Chile's summer lasts from December to February, autumn from March to May, winter from June to August, and spring from September to November. It is an excellent place for engaging in outdoor sports, from climbing and hiking to surfing and white-water rafting to paragliding. It is also home to numerous healing hot springs. Its cities provide all the modern cosmopolitan diversions: shops, markets, cafes, and cultural attractions of all kinds. Chile is known for its fascinating ancient culture and history. Easter Island, famous for its mysterious giant idols, is one of the country's numerous national parks. Northern Chile was the seat of the mighty Inca civilization, until the arrival of the Spaniards in the 16th century. In the rest of the country lived the indigenous Araucanians, also known as the Mapuches. The Araucanians strongly resisted the Spanish, and many Mapuche areas remained effectively independent. Spanish rule ended in 1818, after an army led by Bernardo O'Higgins defeated the royalists and proclaimed an independent republic. As with other "democratic" revolutions in Latin America, 19th century Chilean society preserved a stratified colonial social structure. A strong presidency eventually emerged, but wealthy landowners remained extremely powerful. In the mid-20th century, power alternated between the right-wing General Carlos Ib��ez del Campo, (1924-25, 1927-32, and 1952-58), and the middle-class Radical Party (1932-52), which oversaw increased state intervention in the economy. From 1964 the Christian Democrat Eduardo Frei initiated far-reaching social and economic reforms. But it was too late and by 1967 the country was deeply divided. Leftists thought Frei's reforms were inadequate. Conservatives thought they had gone too far. In 1970, the Marxist Salvador Allende was elected president. Allende's "people's state" program coincided with an economic recession, and brought capital flight and unemployment. There followed price freezes, wage increases, and redistributive taxation. Much of the banking sector was nationalized, as were the copper, coal, iron, nitrate, and steel industries. There were frequent strikes, and a growing atmosphere of chaos. By 1973 inflation was out of control. General Augusto Pinochet took over with CIA help through a military coup in September 1973. Thousands of political opponents were killed during the next 16 years, and tens of thousands were detained and tortured. Yet by the late 1980s, the regime was permitting greater freedom of assembly, speech, and association. During Pinochet's nearly 17 years in power Chile moved toward a largely free market economy, and saw much-increased investment and strong economic growth. In a plebiscite held on October 5, 1988, General Pinochet was denied a second 8-year term, and Chileans then elected a new president, Christian Democrat Patricio Aylwin. He served till 1994 and was succeeded by Christian Democrat Eduardo Frei, the son of the previous president. In 2000 the Socialist Party's Ricardo Lagos won the presidency, and in January 2006 Chileans elected the Socialist Party's candidate again, their first woman president, Michelle Bachelet Jeria. Barely two decades after the end of its brutal military regime, Chile has grown into a wealthy modern nation. It is wonderfully peaceful and politically stable, having shed its bloody war-torn image. Chile is divided into 15 regions, each designated with a Roman numeral (except for the Santiago Metropolitan Region). These regions are further subdivided into provinces. Each province is further subdivided into communes, which are administered by municipalities, each with its own mayor and councilmen elected by their inhabitants for a four-year term.